Taking these different contexts into account, evaluating the different development environments is only possible by identifying the different aspects and value them according to the own preferred usage. User can edit Solidity content in a text editor, there should be at least syntax highlighting. Versioning is supported, eg. by enabling the user to check edited content into a versioning system, show diffs, apply patches, etc. Modification of code by multiple users is supported, at minimum support of different versions of the code is possible to avoid conflicts. 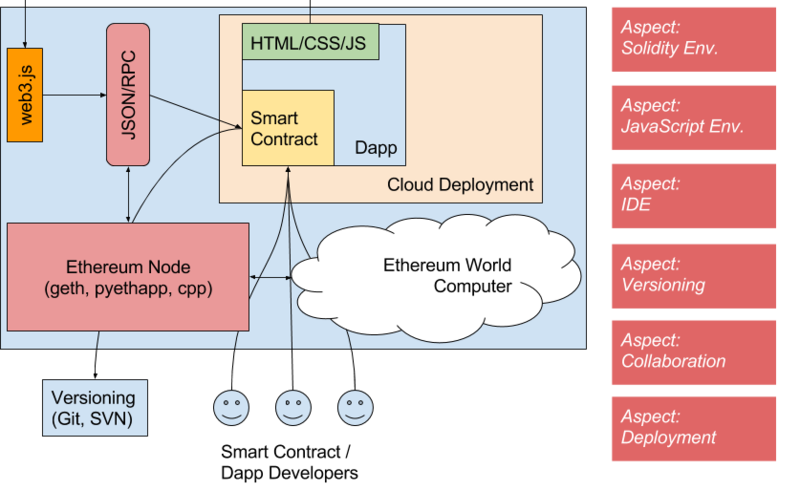 We will summarize in short the different aspects which are supported in these development environment: Solidity Browser / Ethereum Wallet, Truffle and Ethereum Studio. This is also a teaser for the upcoming blog posts, which will explain the environments in detail. In terms of architectural styles, both environments represent minimalism. They are slim and handy, easy to use and fast to learn, but lack some functionality if real development “in the large” is necessary. 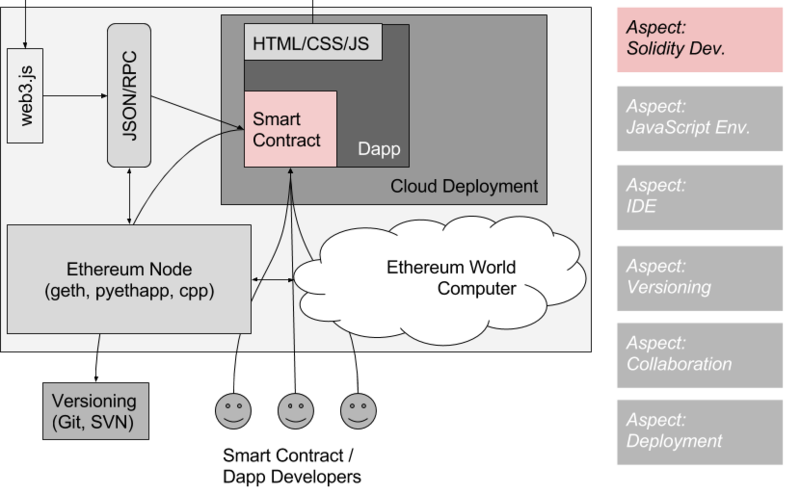 The Ethereum Studio, in our opinion, resembles Deconstructivism. Why’s that? Because here all aforementioned aspects of software development are taken apart and are reconstructed to fit perfectly to Dapp development. This is an all-in-one-solution which we can really recommend, with two limitation: you have to agree to a uncertain pricing model (it just doesn’t exist right now, you can still test the product) and a “closed” environment, which works seemless and smooth, but expects you to let in to this tool and the development process. But no other tool lets you test your code this easy with manual and even unit testing built into the environment. Stay tuned for the detailed explanations of these great development tools. 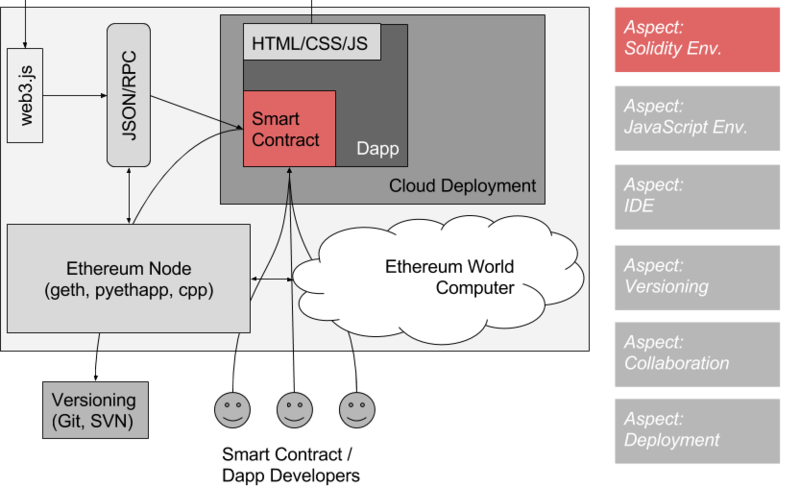 Nach der Entdeckung der neuen Welt und dem Überwinden der ersten Hindernisse wollen wir uns nun sesshaft machen und anfangen, Applikationen und Smart Contracts jenseits von “Hello World” zu entwickeln. Aber wie fangen wir an? Die ersten Erfahrungen mit dem fantastischen Tool cosmo.to waren viel versprechend, leider ist das Tool mittlerweile online nicht mehr verfügbar. 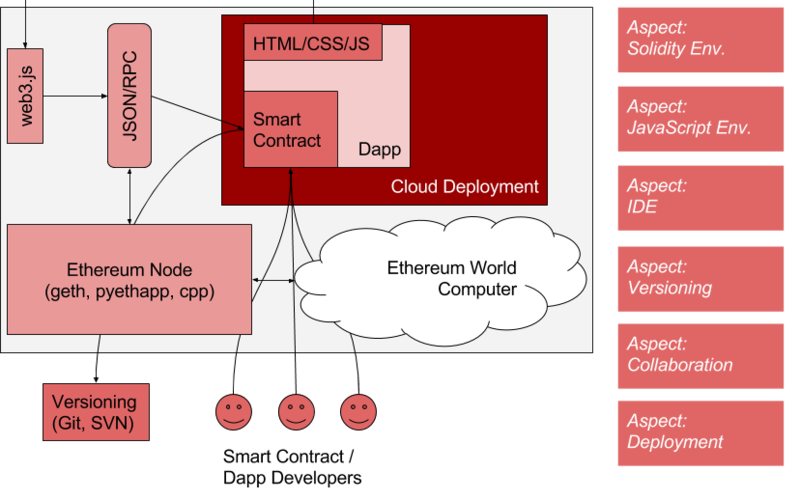 Der wahrscheinliche Grund ist die Tatsache, dass das Standard-Ethereum-Wallet von ethereum.org die gleiche Funktionalität und noch viel mehr bietet. Allerdings zu Lasten der Übersichtlichkeit. Minimalismus: minimal, übersichtlich, aber auch schlicht: der Solidity Browser. Super zum Erlernen der Sprache Solidity, aber das war’s dann auch schon. Persistierung? Versionierung? Alles nicht vorgesehen. Super für den Einstieg. Bauhaus: funktional und praktisch: das Ethereum Wallet dient nicht nur als Wallet selbst, sondern ermöglicht die Erstellung und das Deployment von Smart Contracts und die Verwaltung von eigenen Tokens. Kubismus: ganz anders, aber erfolg- und einflussreich: die Entwicklungsumgebung von Microsoft, Visual Studio (Community) oder der neue Open Source Editor Visual Studio Code zusammen mit BlockApps STRATO, einer zentralisierten Blockchain. Leicht zu nutzen, mit automatischer Frontenderstellung. Etwas für den anderen, schnellen Einstieg in private Chains mit Microsoft Azure. 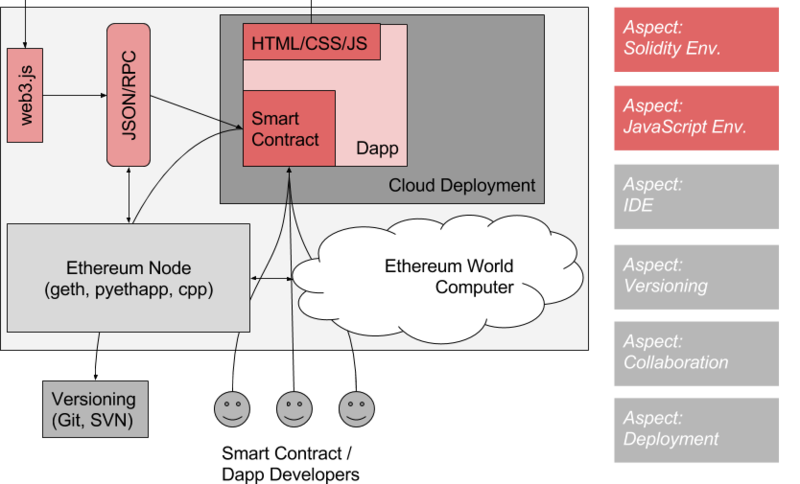 Dekonstruktivismus: das “new kid on the block”, das Ethereum Studio von <ether.camp> macht alles etwas anders, nach unserer Meinung auch besser: eine verteilte Entwicklungsumgebung auf Basis von cloud9, ein integrierter Sandbox-Ethereum-Node, eine Deploymentmöglichkeit in alle möglichen Umgebungen (die JSON-RPC verstehen). Leider auf Dauer nicht kostenlos, Preise sind noch nicht bekannt. In den nächsten Wochen werden wir die hier erwähnten (es gibt noch zahlreiche andere!) Entwicklungsumgebungen genauer testen, immer mit dem gleichen Tokenbeispiel. Stay tuned!